Each case contains (6) 4.5 pound cans of Black Beans, or Black Turtle Beans. 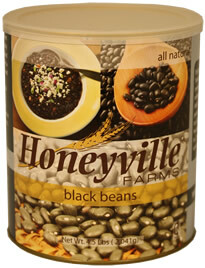 Honeyville's premium quality black beans are an excellent nutritional food source for family preparedness. Commonly referred to as turtle beans, black beans are rich in flavor and are loaded with fiber and protein. Black beans have been a staple in South American food dishes for hundreds of years. Whether you're using them in a chili or soup, as a topping or in a dip, black beans will work well in any recipe. Directions: Soak black beans in water overnight and place in refrigerator. Drain beans. Add 3 parts water to 1 part soaked beans. Bring to a boil, then reduce heat to a simmer for 1 1/2 to 2 hours, stirring occasionally. Enjoy!